Saturday Centus time again. Week 98 so we have exactly 98 words, including the prompt shown in red* below. She admired the boots in the old tired mirror. Tall, soft rust-colored suede. She loved them the moment she laid eyes on them. It had been a long hard winter filled with losses. Her job. Her husband. Her home. Her eyes moved upward, skipping quickly past her well-worn dress to her earlobes now adorned with a pair of exquisite pearls, seemingly at odds with her life. She smiled. Maybe things were finally about to change. 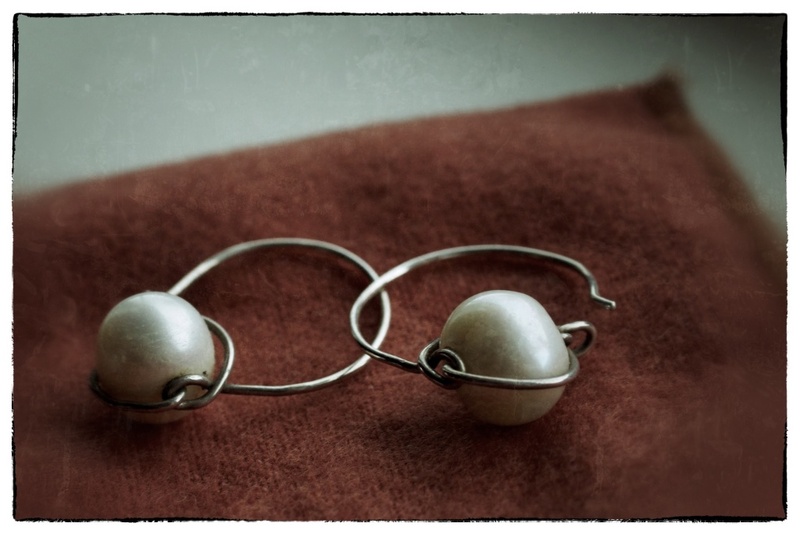 In my twenties, I had a favorite pair of pearl earrings for special occasions. To be safe, I tucked them away wrapped in a small piece of soft cloth in the toe of my favorite boots. At some point, the fashion changed, as it always does, and the boots began to spend far more time in the closet than on my feet. One day, in a spring cleaning frame of mind, I carted them off to Goodwill with a load of other clothes and household items. It wasn't until a few days later that I realized I had forgotten to remove the earrings from the boots. In a panic I returned to the store, hoping that they might still be there, but alas, it was not to be. Even though I was sad to have lost my beloved earrings, I always imagined that they brightened the day for someone who really needed a boost in her life. My Saturday Centus piece, based on this true story, is written from the finder's point of view. Be sure to visit Mrs. Jenny's to see what the other Centusians offered up for their $.98 worth! Well you know what they say, (who ever they are) ha ha everything happens for a reason. Since they had been tucked away for so long, they secretly probably hoped for a chance to escape, and like you say, they surely brightened somebody's day, I just know it! That reminds me I stuck an old ring away....I better go find it! This was a beautiful post today...thanks for sharing not only the Centus but the back story too! And I love the way you turned your sadness about lost earrings into hoping for someone else's joy. Oh no! So sad for you! I hope that the buyer knew what a treasure they received in the toe of those boots! Such a sweet story, Anita. True as well makes it a real winner, a touching winner. I am also sorry for you and your family for the loss of your Uncle Donald. He sounded like a wonderful man. I know a childless couple, he is an ex-WWII marine. With no children, like Uncle Donald. I know you must have dreaded that day when you realized they were gone. I bought myself a pair of pearl and gold earrings when I turned 40. We rented a cabin in the mountains and when I came out of the shower, my hands full with dirty clothes and towels, it was then that I heard something drop and roll. Even though I looked at the jewelry I was holding in my hand it appeared as though nothing was missing. It wasn't until I got home and was putting away things that I realized one earring was gone. My heart sank. I called the owner and left a message and I wrote a letter but never heard back from her. Years later I found a really good jeweler and he ordered another one to match so I have the set again.